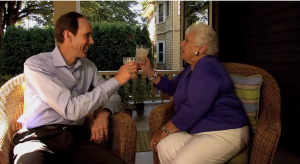 Dr. Brian Druker, director of the Knight Cancer Institute, called Gert Boyle last week to let her know some possibly unwelcome news: Willamette Week was about to publish a story saying she was the person who gave a $100 million anonymous gift to the university to fight cancer. “Gert said, ‘Don’t lose any sleep over this,’” Druker said. There’s much more to the story over at the Portland Business Journal here. The Democrats’ plastic bag ban deprives you of choice and charges you for the free bag they haven’t banned–yet. First the bag banners said bags were killing marine life by the hundreds of thousands. When that proved untrue, the bag banners pivoted to ‘garbage island’ that churned with plastic bags in a gyre “twice the size of Texas” just off “the Oregon coast.” When we busted them for lying, they came back with new nomenclature. 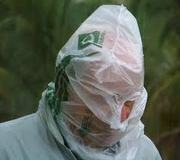 They were no longer merely plastic bags, they were ‘single use‘ plastic bags which MUST BE STOPPED! When people examined their lives and determined that can’t be right, I use those bags to pick up Skipper’s poop from the yard or on our walks, they pivoted to another whopper: there are drifts of evil, single use, plastic bags EVERYwhere. For example, when I asked listeners to KOGO Radio to call me with a litter report, a bicyclist said he’d been keeping track of litter on the side of the road. His report? Drink containers outnumbered bags at least four to one. This kind of result happens all the time. Do your own survey and you’ll discover this is just puffed up claim to sell the ban. Another ‘look over there’ move to decoy you into thinking something important is going on here. And it’s not. If drink containers (in Oregon it was fast food bags) outnumber plastic bags on the sides of the roads and in parks, why aren’t these elected geniuses banning that stuff? Because you’d get really po’d at them, that’s why. You might actually show up to vote and turn them out. It’s a power grab to reduce your choices, it’s a low risk bill that, to some, looks like something but is no more substantial than the bag they’re trying to ban. I’ve written endlessly about this issue here, here, here, here ad nauseum. Been there, done that. Now you will too, California. Unless you stop them. 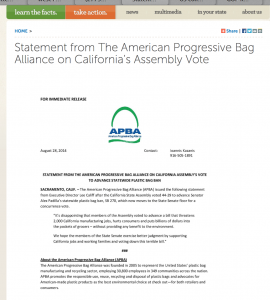 The American Progressive Bag Alliance (APBA) issued the following statement from Executive Director Lee Califf after the California State Assembly voted 44-29 to advance Senator Alex Padilla’s statewide plastic bag ban, SB 270, which now moves to the State Senate floor for a concurrence vote. “It’s disappointing that members of the Assembly voted to advance a bill that threatens 2,000 California manufacturing jobs, hurts consumers and puts billions of dollars into the pockets of grocers – without providing any benefit to the environment.